Get the support you need to safely extend dating of parenteral drugs beyond the usual 24-hour limit—minimizing waste, lowering medication costs, and enabling optimal patient administration schedules at alternate infusion sites. 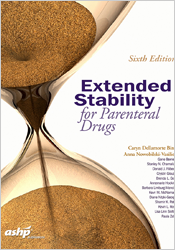 ASHP’s sixth edition of Extended Stability for Parenteral Drugs, by Caryn Dellamorte Bing, RPh, MS, FASHP and Anna Nowobilski-Vasilios, Pharm.D. MBA, FASHP, BCNSP, covers all aspects of determining stability, including the changing elastomeric landscape and the ongoing variability in stability data. • Direct communications from drug and device manufacturers, and a focused review of previously published data from practitioners. With its expanded coverage, many updates, and new information, Extended Stability provides even more support, making it a “must have” for any practice in which pharmaceutical solutions are prepared and administered.